We are pleased to announce that Karen has completed the redecoration of her front door – and we think you will agree that she has made a very good job of it too. An early start on Saturday gave her the chance to give the door a final sanding to flatten a couple of high spots where brushstrokes in the application of the undercoat were a little obvious. Having stripped the door to prevent exactly this uneven finish, a fine sanding was enough to get rid of these. The door was then given a brush down followed by a final rub over with a wax tacking cloth. This is a cloth impregnated with wax that will pick up any remaining dust from sanding a piece of work but without leaving any residue. 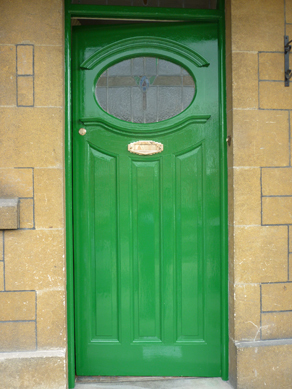 The door was then painted in sections – have a look at our project painting a panelled door for the best way to do this. Obviously the door could not be closed for several hours, so it was propped open using wedges to prevent any uninvited guests during the afternoon! By Sunday afternoon, the paint was dry enough to fix the newly polished lock and door furniture. Well done Karen – and having seen the garage door we think this is likely to be her next project!